Prattville City Hall is located at 101 West Main Street, Prattville, AL 36067; phone: 334-365-9997. Photo: Bell House, ca. 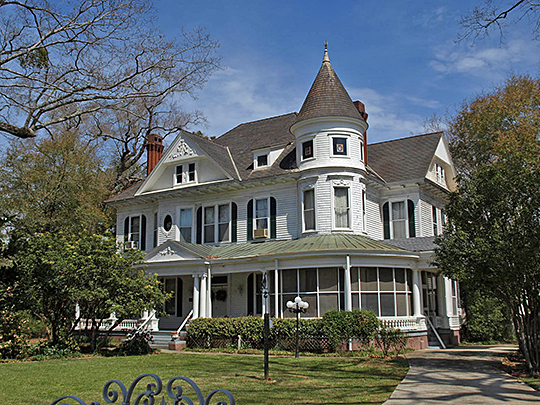 1893, 550 Upper Kingston Road, Prattville, AL. Listed on the National Register of Historic Places in 1999. Photographed by User:Spyder_Monkey (own work), 2010, [cc-by-3.0 (creativecommons.org/licenses/by/3.0)], via Wikimedia Commons, accessed February, 2013. With buildings dating back to c.1848, Prattville contains some of the few remaining examples of antebellum manufacturing establishments in Alabama. Founded in 1833 by Daniel Pratt, long regarded as Alabama's premier antebellum industrialist, the Daniel Pratt Gin Company (predecessor of Continental Eagle Corporation) became the mainstay of Pratt's industrial village (Prattville) in 1838 when he relocated it from McNeill's Mill to its current location. Prattville is often referred to as "The Fountain City" for the numerous free-flowing artesian wells found here. A 1933 edition of the Prattville Progress noted that there were more than 400 of these artesian wells in Prattville and its immediate vicinity, some of which supplied the town's water system. Although many of the wells have been capped, or ceased to flow when relocated, quite a few remain, including several public wells in the Daniel Pratt Historic District. Historic American Engineering Record, Continental Gin Company, Prattville, Autauga, AL, [HAER AL-5], memory.lov.gov, accessed January, 2012. Alabama Historical Association Magazine, Volume 25, Issue 1, Spring 2010, www.archives.state.al.us, accessed January, 2012.